Today we (hubby and I) sat out on the deck (I still say "new" deck) and just listened to the wind blowing as a storm is coming through. 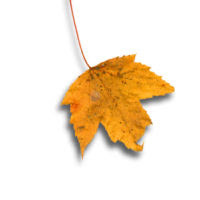 Every time the wind roared, it rained leaves. It was amazing! And, it was still warm enough to enjoy being out there. We called his Mom, who lives next door to come down and join us. We all 3 just sat there and enjoyed the day. MIL shared stories about her youth, which is always intriguing. Hubby said it was one of those "perfect" days...and I agree. 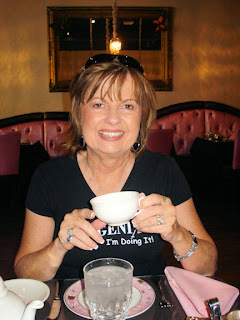 I've been inspired by the blogging community in so many ways! 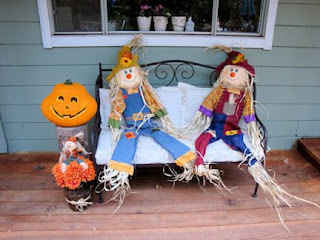 One of them is all the cool Fall Decorating. I have never done that!! Until now....that is! 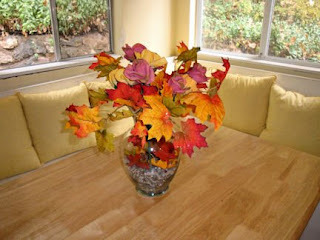 As for decorating by my entry way....why should I? I don't live in a neighborhood. Nobody drives by except the UPS man and my Mother In Law. Even if someone did drive by, they wouldn't even see my entry way....our driveway is long. BUT....what about ME? 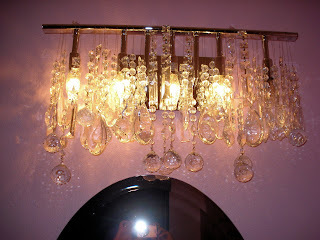 I see my entry way all the time! I started thinking about what I wanted and I decided that I wanted something that would last all of the fall season....not just Halloween. I wanted something Cute and Friendly. And, I found it ALL at Walmart and it was all under $30. Yay! And, Yes! I do enjoy it every time I see it! This is a first.....I've been Tagged! 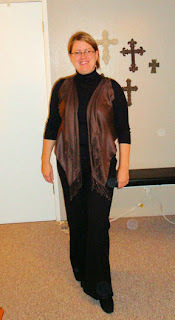 I was tagged by Julie. 1. I never go barefoot...even in my own house! 2. I don't own a dishwasher...I guess that makes ME the dishwasher (and hubby sometimes). 3. I like to sleep in complete dark. 4. I like salty food MORE than sweet....Darn Potato chips...they are evil!! 5. I love clothes...probably more than I should! And, I'm picky about them too! 6. I guess this goes with #5....I'm a shoe-a-holic! I even have a special shelving unit that my husband built for me (and my collection)...sadly, I had foot surgery a year or so ago...and I still have to find only the most comfortable shoes. 7. I'd rather be cold than hot. 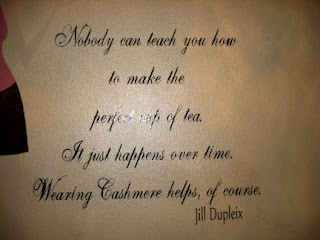 I love bundling up in winter clothes, hot cup of tea, nice fire in the fire place and stormy weather outside. Well. That was hard. I'll probably think of tons of clever things later that I could have put down! I can't wait to see your 7 things!! 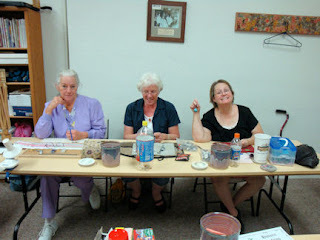 Wednesdays....it's Beading Circle! What a fun time! 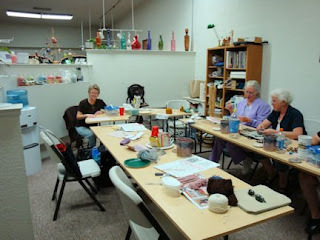 We all meet up at The Hole Affair and work on individual projects. 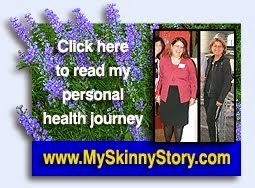 It's a time for sharing, inspiration and friendly chat. 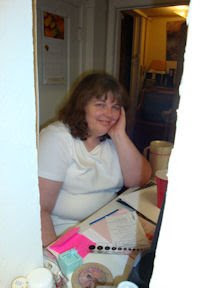 This is Annette, the owner of the store, hiding behind her computer! From the left: Cookie, Queen of Peyote; Rosanne owner of a quilt store called The General Store; Brenda, she can make anything and is SO creative! 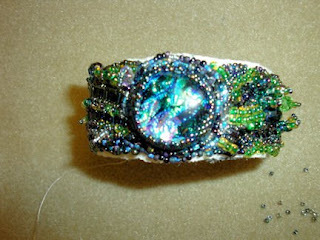 This is Rosanne's cuff, isn't it gorgeous? 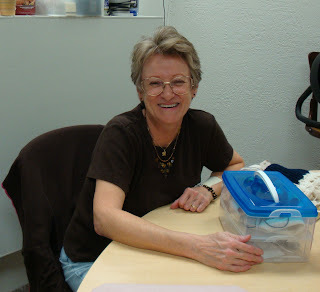 This is Anne, my knitting buddy and Roseanne's mom. This is Kathleen. 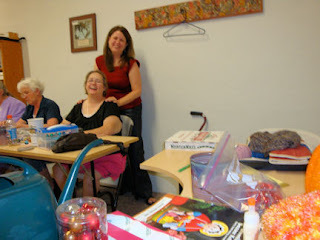 She teaches classes at The Hole Affair and she is such an inspiration!! I can't say enough about her artistry and creativity! 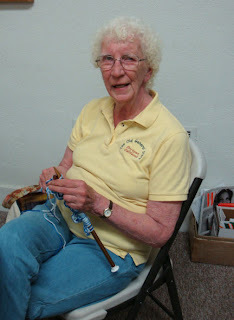 This is Nannette, another one of my knitting buddies. 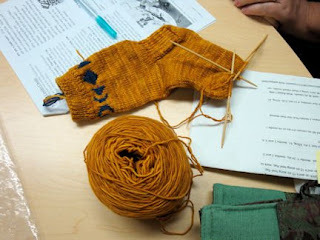 And this is Nannette's project, socks. They have the cycles of the moon, isn't that so neat? Kathleen is showing me the peyote stitch. I may have something to show soon. Fingers crossed!! My dear daughter came over yesterday....just to spend time with me! Aren't I the lucky one? 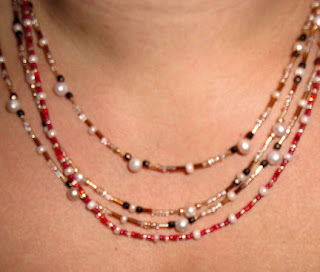 We decided to use some of my beads to make a necklace. DD (dear daughter) is very creative. 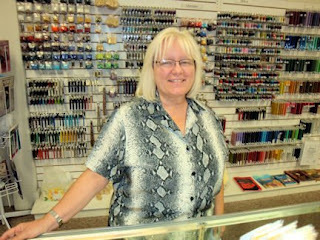 I admitted to her that my favorite part of the whole beading craft is, buying beads and organizing them! She was just chomping at the bit to make stuff out of my vast collection!! 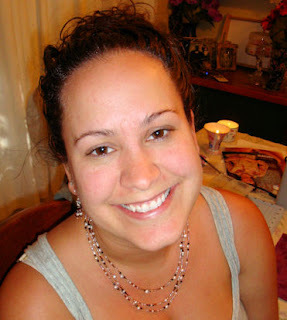 Here she is modeling the beautiful 3 tiered necklace that she made for me. Isn't it stunning? 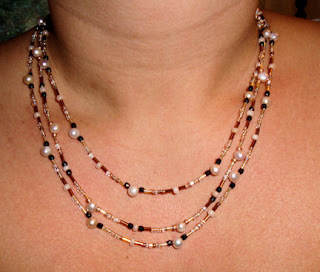 It's pearls and bronze colors. It will go with anything. I made earrings to match. 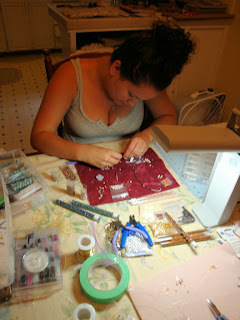 When I finished my earrings before she was done with the necklace, I had an idea. What if I had a RED necklace to go with it? I could have necklaces in many different colors ( a blue one, green one etc) and then I could just wear the one I want with this set and it would be "convertable" if you will, and it would go with so many things. What do you think? Every time I wear this jewelry, I will think of DD and be reminded of what a lucky Mom I am to have such a sweet girl! Thanks for the necklace sweetie, you can come over any time and make stuff for me!! I'm Late....for a very important DATE!! It's Pink Saturday!! 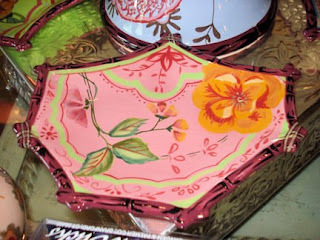 If you are in the mood for Pink....stop by Beverly's and you will be amazed!! 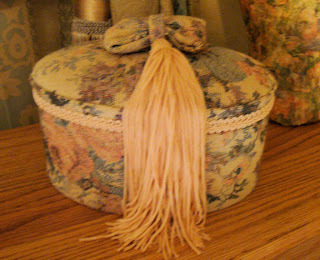 This little item has a bow, a tassel, tapestry material and trim. ALL favorites of mine! ALL in one cute little package. Of course it's a favorite!! 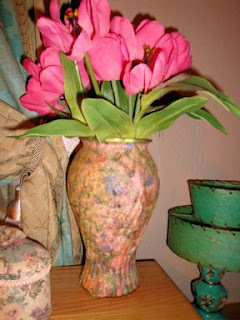 This vase is special. 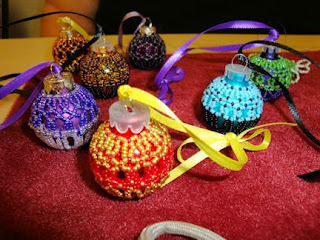 If you have kids, (mine are all grown now), you may have lots of wonderful things that they made just for MOMMY! What on earth do you do with it over the years? All those odd little items that are sooo sentimental? Well this vase was made by my youngest in cub scouts many years ago with a vase and glue and paper napkins (pretty pink napkins). So, yes it's sentimental to me. AND....I also just plain love it! 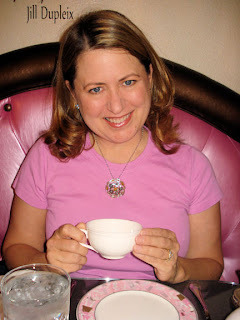 It has texture (from those napkins), it's pink, and it's "me". And, I might just have a macaroni necklace in my jewelry box too!! This is something I saw in a magazine. I like the one in the magazine better (go figure). This is a test and I think I will try it again. This is the "after" front view. I am going to try to find some kind of cool clasp to try in the front or just leave it alone...what do you think? 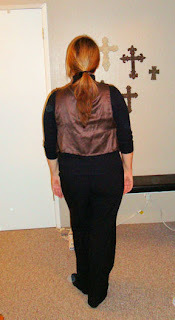 This is the "after" back view. This is what it was before. It was one of those long wide scarves. It wasn't as wide as the one in the magazine. 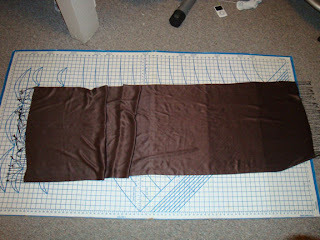 If I try again, I will use a wider one so that I can make the back longer in a drapey triangle. It is made by cutting the scarf into 3 pieces. 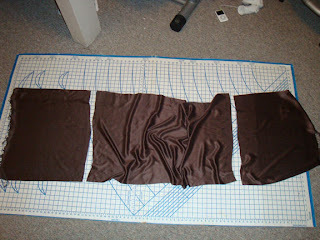 The 2 with fringe are the front and the square is used for the back. I'm looking for another scarf to cut up. It's those scissors again, they are out of control!!! 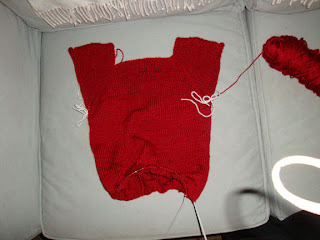 Knit Knit Knit...when will it ever get finished? Happy Pink Saturday to YOU!! 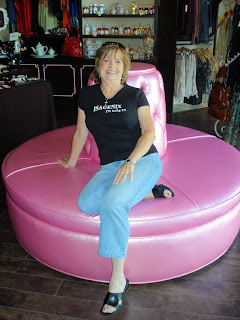 If you love all things Pink...visit Beverly's for more PINK! How lucky am I? 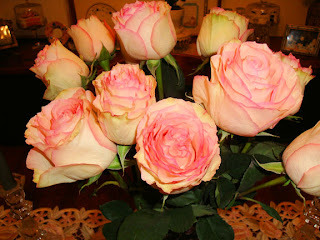 I received these beautiful roses from hubby for our anniversary! And, they are PINK!! Does he know me or what? I look forward to them opening up even more. 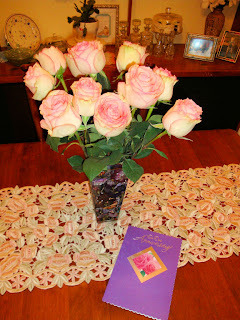 There are even Pink roses on the card. Hmmmm. We went to Yosemite for a couple of days....it's our thing. Nice and quiet. Lot's of bike riding!! And, I always have to scope out each and every gift shop in the park. 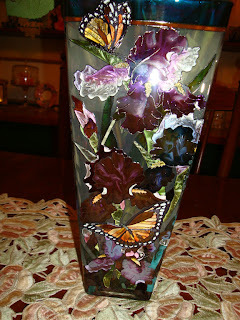 I admired a beautiful vase and of course I didn't buy it...to expensive!! Well, guess what hubby gave me for an anniversary present?? Yep, you guessed it! It's not pink....but it does contain the pretty pink roses...does that count? Oh! 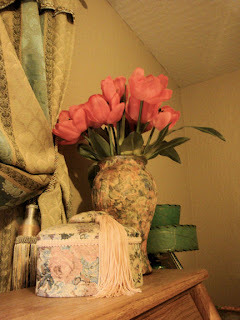 And, it's sitting on one of my favorite things...that happens to be pink and green. 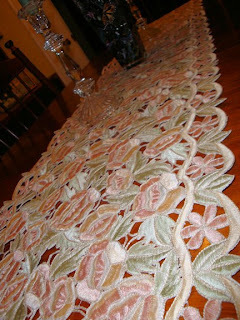 It's a cut out table runner that was a gift from my sister many years ago. Happy Pink Saturday! I hope that you are doing something wonderful this weekend!! Sometimes it seems like a long time ago (were we ever really that young??) and sometimes it seems like yesterday!! We celebrated our 25th Anniversary yesterday !! My marriage advice: Marry the right person. Heh! I totally lucked out and married the best husband in the world!! No, he's not perfect...he's just perfect for me. 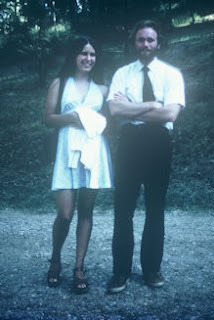 We met in high school and here we are before his graduation in 1975. I was attracted to his great sense of humor...and he is still hilarious!! I think he liked me for my very short skirts (don't wear those anymore!!). 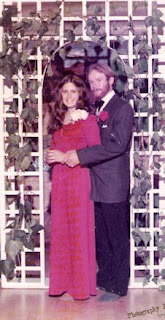 Life pulled us in different directions and we reconnected in 1981 and got married in 1983. 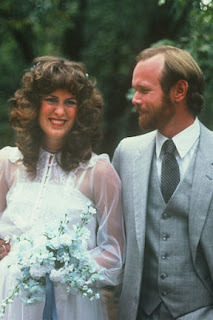 If you saw my blog about my daughter's wedding, we got married in the same spot! So, here's to the next 25! 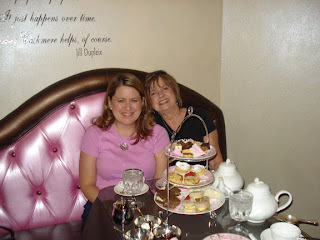 Country Mouse (that's me) and City Mouse (bff) met up in Phoenix last weekend. It was a business training...and of course we managed to squeeze in some FUN!! 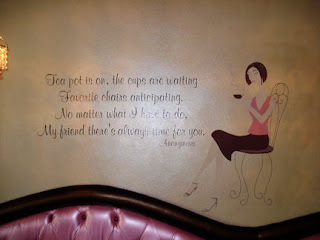 It took a bit of sleuthing to find a "Tea House" nearby. 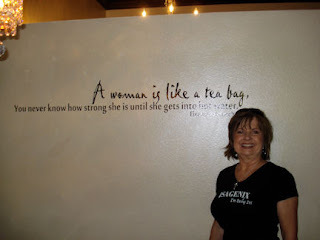 We found this fabulous place in Gilbert AZ called Tea Dreams. If you are ever in Phoenix...you must go there! 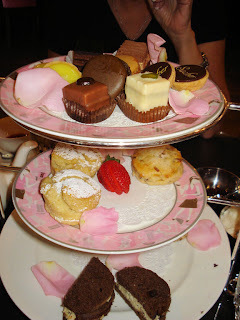 We are used to the typical Victorian Tea houses (which we LOVE!). This was totally different and we were both delighted! The colors were PINK and brown. This is the logo and they even had dishes made with the logo, lady and all on them! Fortuitous that I was wearing Pink....I blended right in!! We ordered the Duchess. Doesn't that sound GRAND? 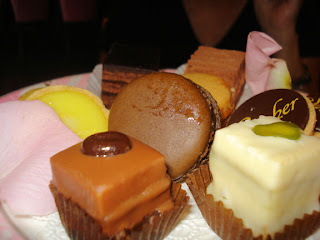 It was so delicious....these pictures are making my mouth water! Desert? Are you kidding?? Of course. And, we ate it ALL!! 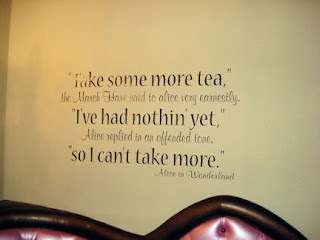 They have some wonderful quotes painted on the wall. Hope you can read them. 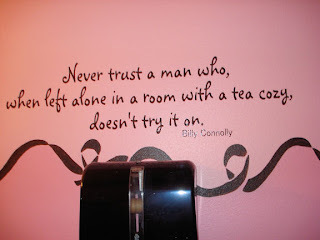 This is in the bathroom. 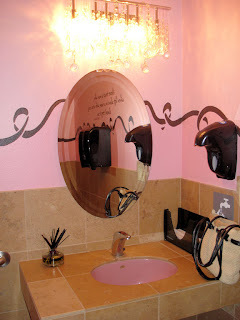 I came across some bloggers that were taking pictures in public bathrooms....I should find them. I never thought I would be so inspired to join in!! 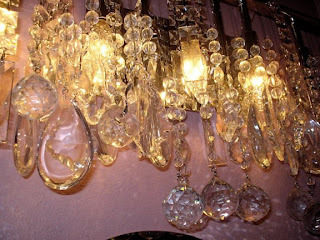 I just adore the way that they hung crystals on this light fixture. I truly admire people who come up with such creativity! 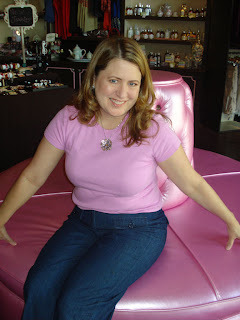 Isn't this round couch sooooo Pink Saturday???? What a fun time. Wish I could do it all over again....right now! !